36 February / March 2015 Elearning! collaboration and engagement Let's defne what we mean by colla- boration. It is "the ability of two or more people to work together on a common outcome or goal." Distributed collaboration consists of collaborative interactions across time and space; it could be diferent geographic sales ofces or training facilities, or it could be with external participants, like customers or partners. It turns out that collaboration is a major factor in engagement and improving future engagement. COLLABORATION TOOLS USAGE In looking at how collaboration sofware and infrastructures are being used (Fig. 1), we found that email was still the most- used collaboration tool, but that its use is dropping. In a 2012 survey of the same population, 98 percent surveyed used email. In two years, that percentage has dropped five points, and this change was seen most dramatically in sales and marketing organizations, which ended up being the lowest users of email at 78 percent, a 20-point drop in two years. One of the reasons for the decline of email in sales and marketing was the increased use of chat/IM/texting; 90 percent of those in this department use them. Combine this with the use of in-app messaging and we can start to see how e-mail usage dropped so precipitously. Desktop and Web conferencing (65.3 percent) has passed room-based conferencing (60 percent) for the frst time. Tis is a good indicator of the changing nature of meetings. More meetings today are hybrid meetings, where some people are local or in the room and others are participating at a distance. It also shows video-conferencing is quite popular as a collaboration tool. When we looked at which collaboration technologies people currently own, 70 percent (the highest of any technology) own some form of video conferencing today. Training (63.5 percent) got such a high score because of two reasons: the population of respondents to the survey, and training occurring in almost every department in the organization, much of which is seen as a collaborative interaction. Te benefts of collaborative were queried: 89.3 percent said, "to work with others on a team or project," and 87.4 percent said, "to connect with colleagues within our organization." 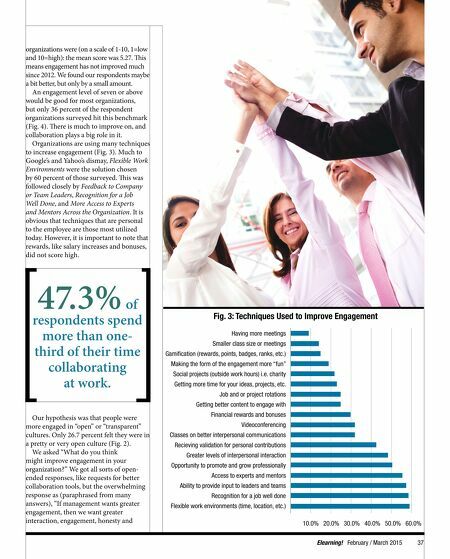 And 47.3 percent spent more than one-third of their time each day collaborating. IMPROVING ENGAGEMENT Employee engagement is at an all-time low! A recent Gallup poll revealed that only 30 percent of employees are engaged, another 50 percent are "checked out" or not engaged, and the fnal 20 percent is miserable or actively disengaged. It is also clear that employee engagement is linked to proftability, industry leadership and the bottom line. When asked how engaged the respondents' Not very open Starting to open up a little Goal or initiative to be more open Pretty open Very transparent organization 26.70% 19.80% 27.70% 19.80% 6.90% Fig. 2: How open or transparent is your organization's culture? 93% 65.2% 60% 64.3% 41.7% 49.6% 47% 63.5% E-mail Chat/SMS/Texting Room-based videoconferencing Desktop/Web-based videoconferencing Public/Private social networks Screen Sharing Collab doc/cont mgt. Fig. 1: Current use of collaboration software 26.7% of respondents work in an open and transparent work culture.